Currently viewing the tag: "FatMax"
You thought you were done outfitting your shop — Stanley’s taken a rather mundane staple of the shop, a stacking parts bin, and found a way to make you want to throw out your old bins and buy new ones. They equipped an 11.5″ deep by 6-3/8″ wide by 5-1/8″ high bin with a sliding cover, not unlike a rolltop desk, and gave it a handle for easy transport. The sliding cover on the Stock and Carry clicks shut to keep the contents inside and dust and dirt out. You can sit them on a workbench, hang them from racks, or put them Stanley’s Lock and Stock Organizer. ‘Tis the season for Dealmongers. 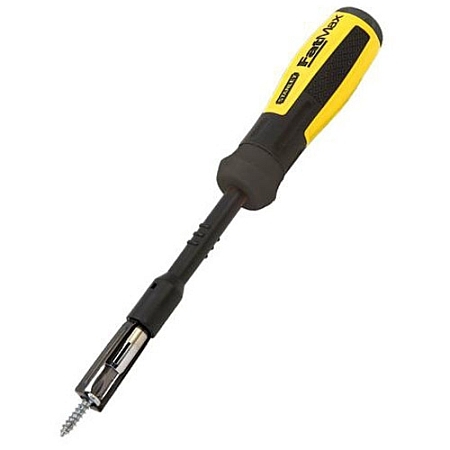 You can get the Stanley 69-188 FatMax Clip-n-Grip screwdriver from Buy.com for $7.99 with free shipping (as long as you remember to specifically click that option during checkout). TM has posted about screw-holding screwdrivers before (TM 9/1/09, 4/15/09, 5/30/08, and 1/30/08), but this is the first one I’ve seen that combines screw-holding with multi-bit options — looks like one of the screw-holders slipped into the multi-bit drawer when we weren’t looking. The FatMax® Clip-n-Grip™ comes with six CrV steel precision machined bits, which store in its end cap, a “bi-material handle for increased comfort,” and the integral Clip-n-Grip screw-holding system. No lasers and non-ratcheting, but you can’t have everything. At the time I write this, Amazon also has the $7.99 price, but they link to Buy.com. 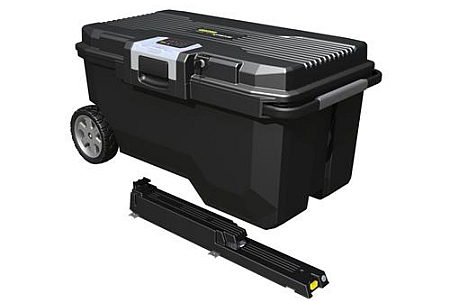 The Stanley® FatMax™ Portable Truck Box (part number 036800R) is a 42-gallon capacity storage system that’s 22-1/4″ H × 44″ L × 19″ W. It has a water-resistant seal, a security system with alarm and code panel, heavy-duty 8.5″ wheels, and locks into a docking station that can be bolted to any truck bed. Pricing and availability information is a bit sparse: the only price estimate I’ve been able to find is $290, which is in the same ballpark as crossbed boxes, and apparently only Lowe’s carries it. Does its roll-around portability make it more useful than a crossbed or other truck bed box? What do you think? Update: The people at Stanley gave us a quick ring with a little more information. First, this will sell for right at $200. Second, this is actually a security box. 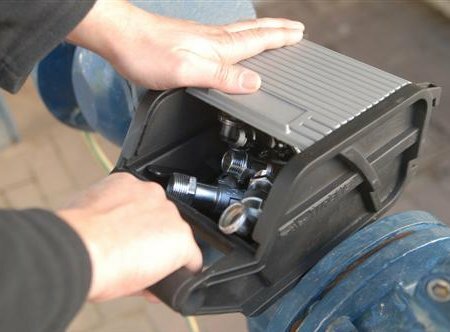 It locks to a docking station in the back of your truck and is unlocked with an electronic keypad. Basically, the idea behind this product is to keep people from ripping off your stuff while you’re parked at Home Depot, Lowe’s, or a quick stop at the jobsite. You’ll hear more about this product soon — we’ve got one in for test.